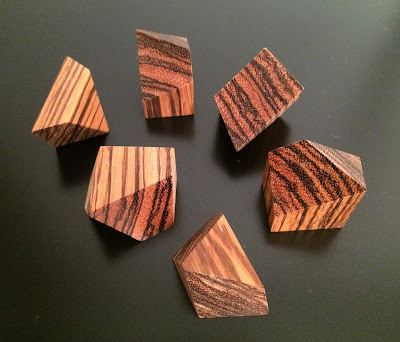 Here's a second puzzle I played with designed by Bill Sheckels and exchanged by Norton Starr (what a cool name! And nice guy too!) at IPP34 in London two years ago. The earlier one was the Packed Pyramid, this one's called Octassembly. This puzzle comprises 6 odd shaped pieces made from Zebrawood with a very nice stripey surface. There are three different shapes and each has one identical pair. All nicely cut! 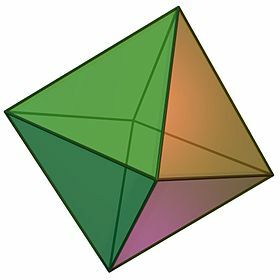 The object here is to form an Octahedron. Now if you don't know what an octahedron is, like I didn't at the beginning, you probably won't know even where to start nor what to do. I know its got something to do with eight tho'. Thanks to the internet....this is an octahedron. Basically two 4-sided pyramids joined together at the bottom. From the puzzling point of view, its not too difficult...once you know what shape you need to form. But the way the pieces have been cut (and I am sure there is some mathematical aspect to this...don't ask me what it is) make it a tad tricky. Quite amazing how the odd looking pieces can form a symmetrical 3D object.